The New Mexico Railrunner, an important regional transportation investment. Photo credit: LightRailNow.org. Albuquerque, 2014: Our population is decreasing and high wage jobs are few and far between. Our local government has a growing list of projects to construct and a shrinking tax base. In addition, several indicators in our community have changed since the recession. These indicators range from people per household to average income to home ownership rate. All of these changes have not led to changes in how public (and even private) projects are built and prioritized. One of those indicators is motor vehicle miles traveled per person or per capita VMT, the topic of this article. This next section is very important. I’ll call it “How Cities Decide to Build More Roads” or “The Road Gods“. Municipal traffic engineering departments base road construction priorities around something called a Traffic Demand Model (TDM). TDMs are computer simulations that calculate projected amounts of motor vehicles + population + other indicators on city roadways. Based on the results of these models, the Road Gods then decide which roads should be built, expanded or kept as is. The City uses traffic projections to plan their projects. They are not looking at past traffic patterns but the modeled traffic demand in 2035. However, since the mid-2000s, these models have become extremely outdated and irrelevant. They are leading to decisions which are having a dramatic negative effect on our local transportation infrastructure. The black line signifies vehicle miles traveled per person in the United States. The dark shaded areas represent recessions. 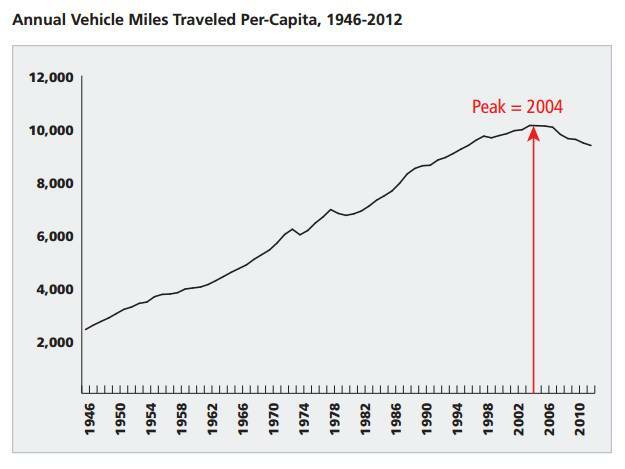 This chart captures a growing trend in America: not driving. Americans across the demographic spectrum are simply not driving as much as they used to. What About New Mexico? We Drive a Lot Here! 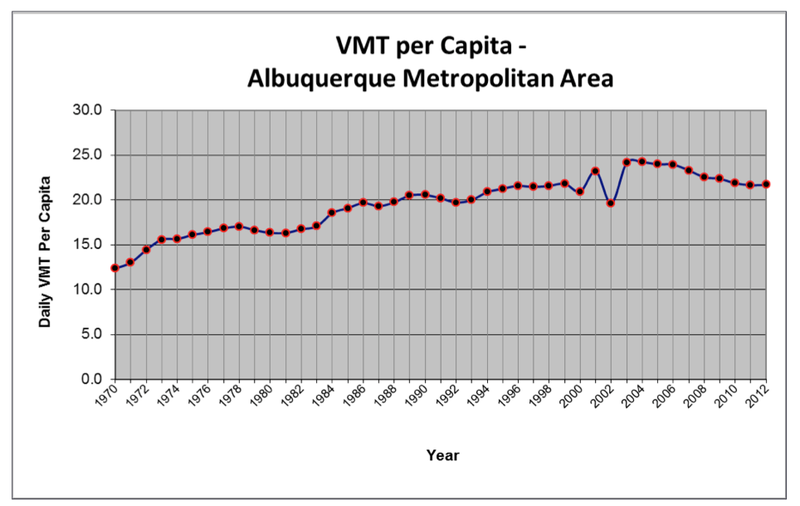 This chart reflects the declining automobile usage rates in the ABQ metro region. In Albuquerque itself, the declines are far more significant. As you can see, driving has declined or stayed flat every year since 2004, in our metro area. 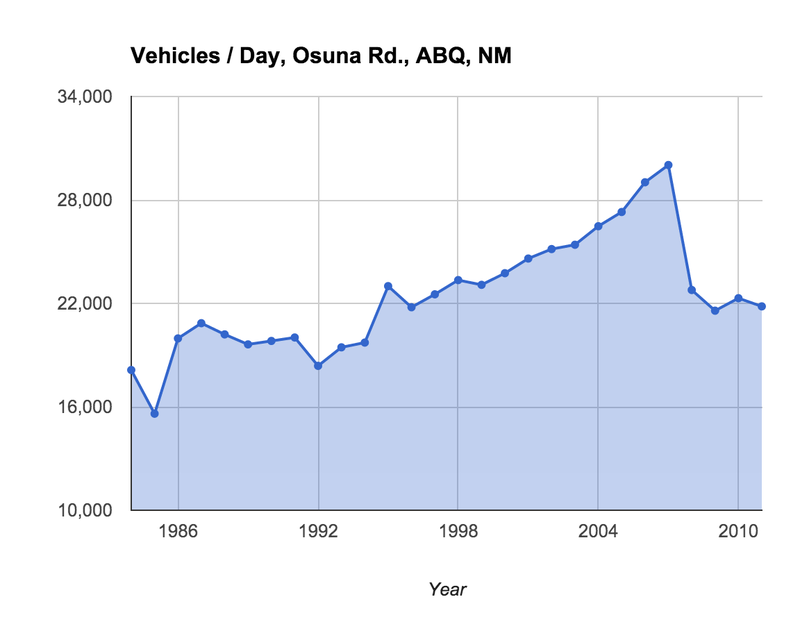 Also, the declines in Bernalillo County (the location of Osuna Road) are far more significant than those in other surrounding counties. For example, the chart below shows these differences. These variations reflect development patterns in the newer more suburban portions of the Albuquerque metro area. 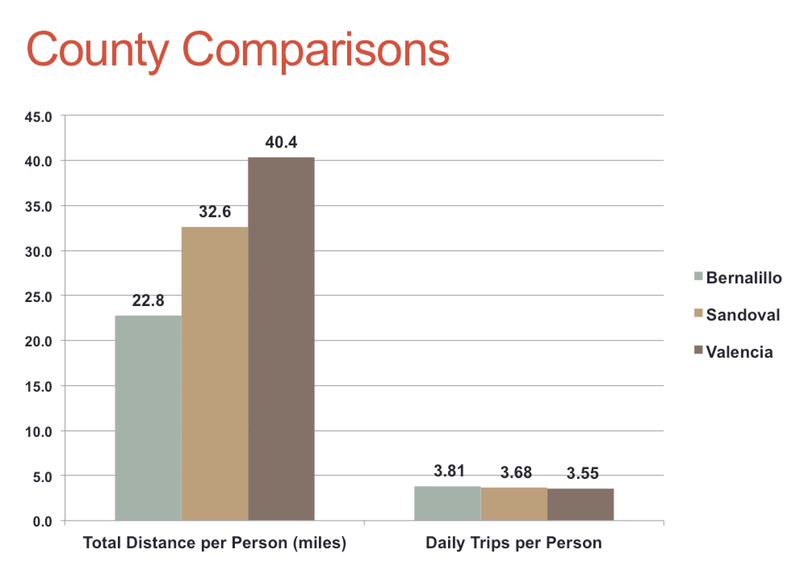 People in Bernalillo County drive far less than those in surrounding counties. As you can see in the chart above, residents of Albuquerque drive half as many miles per day as people who live in Los Lunas or Belen. We are making transportation infrastructure decisions with outdated models which do not reflect behavioral changes! We now return to Osuna Road, Albuquerque, NM. The red line symbolizes the area that is proposed for widening. Here is a link to the Google MyMap: http://bit.ly/ZpJyO0. Osuna is an interesting road. It starts as a major arterial with an interstate highway off-ramp and eventually dwindles down to a minor neighborhood street. During the early 2000s, traffic counts were increasing dramatically, but recently, they have dropped to early 1990s levels. 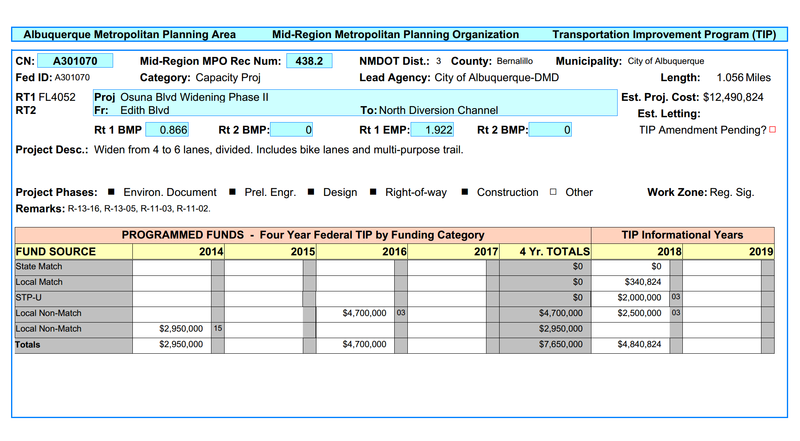 According to the regional TIP (transportation improvement program), Osuna is listed as an approved project. The TIP goes through a hypothetically public process, though mid day meetings, which are not heavily advertised hardly count as such. The data points on this chart are averages of the numbers counted on the portion of the corridor recommended for expansion. Look familiar? It is a mirror of the national trend from the chart earlier in the article. AND HERE LIES THE PROBLEM: Osuna is currently high on the list of proposed road widening projects in the City of Albuquerque. According to vehicle count data from the MRCOG website, Osuna currently experiences little to no congestion. For example, Central Avenue currently handles 30,000 vehicles per day with two lanes in each direction so there is hardly a need for 3 lanes on Osuna, which currently averages 22,000 vehicles/day. 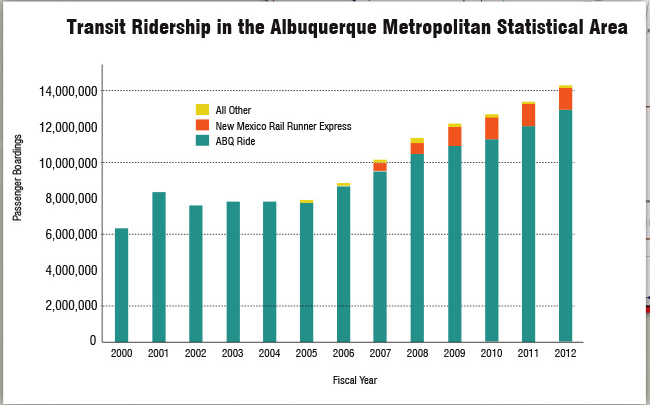 This chart captures the changing travel behavior occurring in the ABQ metro area. 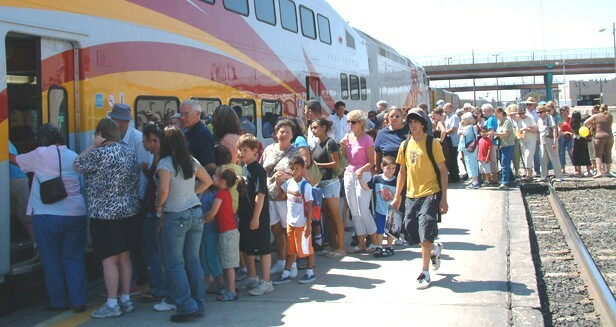 As you can see, transit ridership in the Duke City has almost doubled since 2004. Many of those motor vehicle trips seen in previous years are never coming back. 2. Osuna is not a regionally important road. By this I mean that it does not cross the Rio Grande River and it never will. As a result, it is unlikely that high traffic counts will return to Osuna at any point in the near future. 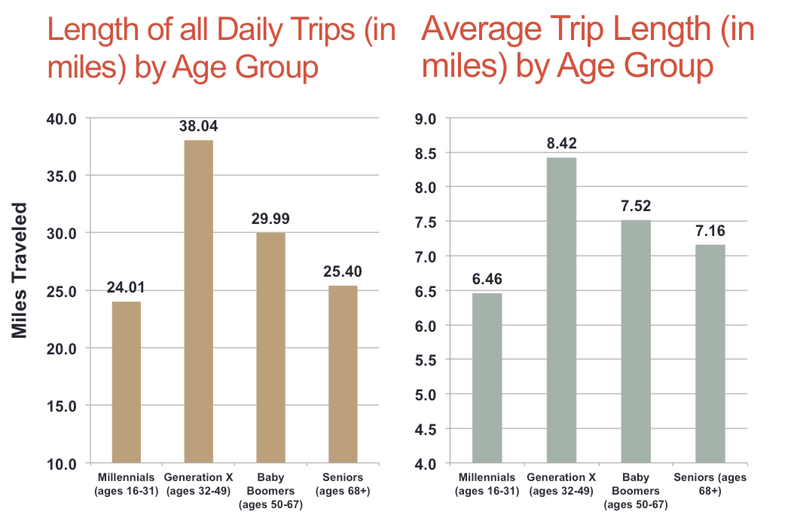 This chart highlights the fact that overall, younger people are driving significantly less than other generations. High youth unemployment only accounts for a portion of this behavioral change and it reflects national trends. Why is this $7 million road widening project a high city priority? Aren’t there more pressing projects to which this funding should be allocated, projects which would lead to much higher return on investment (ROI)? In my next article, I will discuss projects which should be a higher priority and how it all relates to our local economy. Call or email your local elected official and tell them that widening Osuna Road is an inefficient use of taxpayer dollars. Osuna is located in Council District 4, where the City Councilor is Brad Winter. I also encourage you to contact your own councilor. I’ve said it before and I’ll say it again: when elected officials receive 10+ calls or emails about an issue, it becomes a high priority. thanks for the analysis. Can you explain why traffic counts dropped so much during 2008? 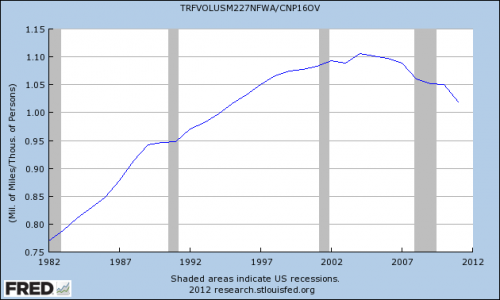 Obviously, we had recession, but that is a huge drop. The drop stayed steady for several years, maybe we can also find newer data? Would a road diet be an effective use of money on this road, or is it too non-commercial? You’re very welcome, thanks for commenting. I think the Recession is responsible for the majority of the drop on this corridor. Osuna is primarily a commercial corridor. I think are were a lot of contractors, builders etc. who are located nearby. The drop in single family home construction likely had a massive impact on this part of town. In future posts, I’m planning on doing similar analysis of nearby corridors. Unfortunately, I have to do them manually so they take some time. I’m curious to see how the year over year traffic counts compare on San Pedro, San Antonio, Jefferson, etc. Regarding newness of data, I used the newest available data. I wish I had newer data, I’m very curious. A road diet in this corridor isn’t the right solution. In my opinion, they should add landscape buffered sidewalks and buffered protected bike lanes but no new automobile lanes. There is more than enough available right of way to do this. It would also be a good choice to add some transit service to this corridor. It currently has very little. Thanks for this kind of thoughtful analysis. In that document and meeting they recognized the fact that it didn’t really need to be widened. However, I remember from the meeting it seemed to catch Brad Winter off guard that they were going to grab money from a project in his district and distribute it to the rest of the city and he understandably wasn’t happy about it. One thing the counselors promised him was that if they grabbed the money from hist district they would put it back when feasible (i.e. after the Paseo del Norte interchange was completed). So that all said, I think any proposals you suggest or come up with for that 7 million would need to be projects in Brad Winter’s district if you want a chance of reasonably changing the priority. On a different note I like the idea of going back to the design phase and changing the design to buffered bike lanes + 2 lanes + side walks + median landscaping. Although, I think I would rather see the 3 lanes + bike lanes + side walks + landscaping on Osuna than nothing at all done to it. Thank you so much for bringing this to my attention! I wonder why this information was not reflected in the long term TIP. Also, where did you find this document? I wish the city website was not so difficult to use… but I’m glad to hear this project has been delayed. That’s a good point about focusing on reallocation within his district. It sounds like they are still considering doing this project in the near future and it is still in the books so it will certainly be something to keep an eye on. With that in mind, I think redesigning it with a focus on sidewalks, native landscaping and buffered bike lanes might be a good choice. The final cost of doing all of that the right way could possibly be in that $7 range, justifying the fact that’s it’s still money being spent in his district. No I just remembered the meeting and Googled until I found what I wanted, not sure why it was on that site. Here is the video of the council meeting, http://cabq.granicus.com/MediaPlayer.php?view_id=2&clip_id=20, the city does a nice job on their videos, in the minutes section click on R-13-125 and it will jump to the discussion. It is long. I am not sure about the TIP documents this is discussing the GO money allocated to it. From rewatching it looks like it is already designed and approved and they have $2.8 million GO allocated to it, then plan to have the 2015 GO bonds contribute the other $4.2 million (not sure when these get finalized I guess Marchish 2015?). Then they could put the whole thing out the bid for $7 mil (and maybe save some money if it is unphased). So its delayed, but I would expect them to get started on it as soon as Paseo is done. Anyways you should watch the video, but unless feelings have changed in the last couple of years I think it would be quite the uphill battle to change Osuna plans now. Oh also, they jump around about talking about the Osuna widening. The discussion is 2 hours long, but if you watch from the start of R-13-125 until public comment, then skip public comment, then they will get back to the Osuna thing, then I think you can stop once they start figuring out how to pass amendments.